Slip and fall injuries in the United States are a serious cause of personal injury, with dangers of falling being all too real for people at home or at work. According to the Occupational Safety Health Administration (OSHA), most general work-related accidents in this country involve someone who slips, or trips, and falls with a resulting injury. Falls at work are serious: these fall injuries, according to OSHA, are the cause of 15% of all accidental deaths, and result in more on the job deaths than anything other than motor vehicle accidents. In fact, OSHA has established general legal standards for all surfaces (floors, walkways, stairs, decks, etc.) that are found at work sites (except for mines, agricultural work places, and domestic work). There are special rules to be met by employers to protect workers from fall injuries who are working construction, or in water-related industries like shipyards and marine terminals. All these OSHA federal regulations regarding protecting workers from falling injuries by regulation of walking surfaces can be found at 29 CFR 1910 et seq. Fall injuries at home are an equally serious concern today. According to the National Institute of Health, falls are the 2nd leading cause of unintentional death in homes and communities. Their studies show that over 25,000 people died from a fall at home in 2009. Men are at higher risk of accidental falling injury than women. Once people hit 54 years old, age changes things: after age 54, women have a greater change or being hospitalized for an accidental fall in Florida than men. After Floridians reach 84 years old, then the risk of falling injuries skyrockets: this age group, for both men and women, has the highest rate of fatal falling injuries and non-fatal hospitalizations due to falls than any other age group. As shown in the above chart, falling injuries have been increasing each year in Palm Beach County; however the increase has not been as striking as the falling injury fatality rate state-wide. 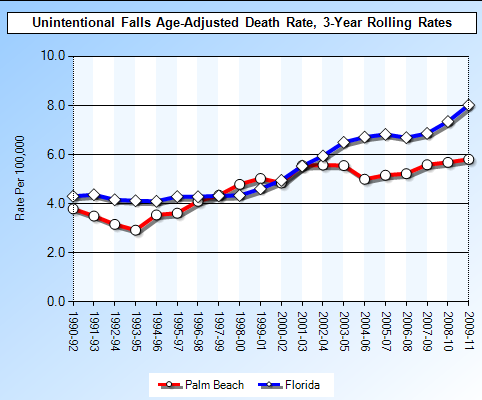 Florida’s falling injury death risk has doubled since 1990; meanwhile, Palm Beach County has increased significantly, at approximately 6.0 per 100,000 in 2011 as compared to 4.0 per 100,000 in 1990. 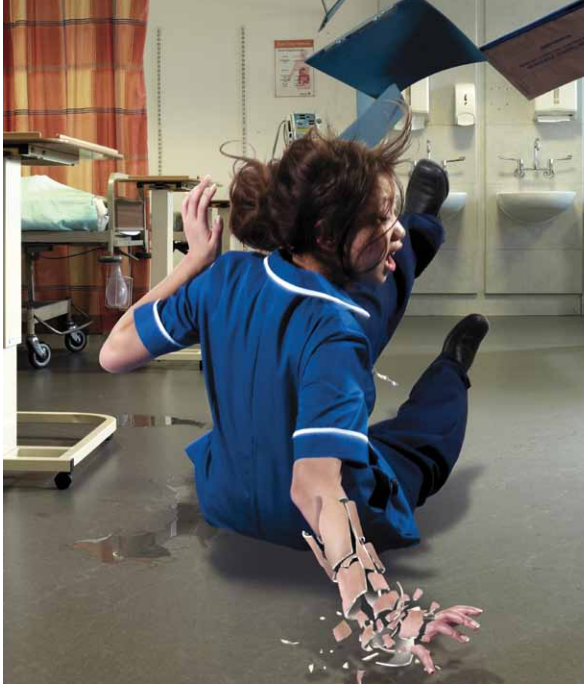 What are the causes of death for these falling injuries? In almost half of the deaths in Florida caused by slip and fall injuries, traumatic brain injury (TBI) head trauma resulted in death. 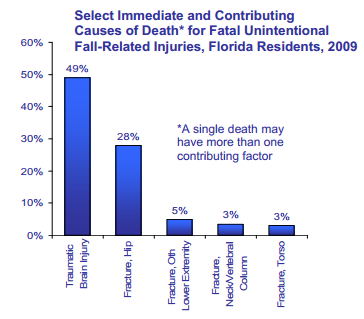 According to the Department of Health, most deaths from falls in Florida during 2009 were caused by traumatic brain injuries (49%); followed by hip fractures (28%); lower extremity fracture (5%); neck or spinal column fracture (3%); and torso fracture (3%).